Fatherhood has tranformed. Do we expect too much from modern dads? What does it mean to be a dad these days? In many ways fatherhood has transformed from an authoritarian, provider role to a much more nurturing and active one. Whereas fathers traditionally took a backseat in childrearing, now they’re expected to be present and engaged in literally all aspects of parenthood. From attending antenatal classes to supporting their other half in the labour room, to feeding, changing and nurturing their child’s development in a myriad of ways, modern fatherhood involves diving in headfirst and getting your hands dirty. The figures add up too. In 2016 the average dad spent eight hours per week doing childcare, which is significantly more than the 2.6 hours that men with kids spent, back in 1985. 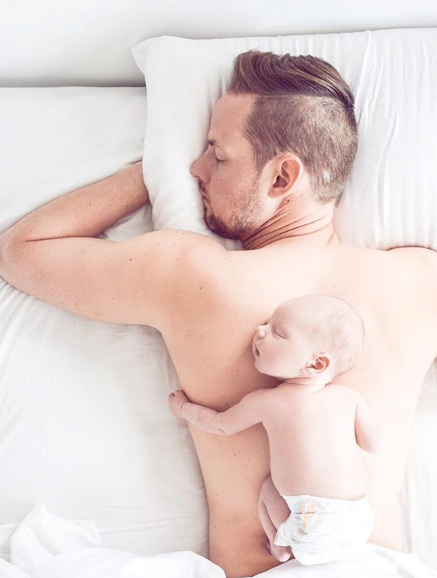 As the role of fatherhood has evolved it has meant there are a lot of new expectations put upon dads that are probably quite different to the way today’s dads were raised by their own fathers. Mothers expect help with labour preparation, hypnobirthing, night feeds, changing nappies, weaning, burping, playtime and more. And why not? This shift to a more equal way of parenting may not be 50/50 in every household, but increasingly, there’s a cultural move toward sharing the responsibilities more evenly. It means dads and dads-to-be can feel enthusiastic about the opportunities they have to be involved, but the flipside is they can sometimes feel overwhelmed as they embrace modern fatherhood without a point of reference from their own upbringing. Supporting mothers to adapt to their new role is commonplace – but what about the fathers? I really believe they also need support to feel prepared for parenthood and need the right tools to help them to navigate their role with confidence. You wouldn’t start a new job without a bit of training and immersion first, so why shouldn’t dads be given more attention and time to get them primed to hit the ground running? It’s something I feel passionate about and it’s one of the reasons my online antenatal course, HATCH, has dedicated modules for partners and dads. Parenting is tough gig and preparing fathers not only helps the women I work with – and the children they raise – it also helps strengthen couples by giving them the tools they need to work together as a team. Learning the practical stuff is just as important as preparing emotionally. It surprises me just how often fathers are expected to make it up as they go along and wing it without being given any help, because men increasingly want to be more involved and are hungry for information, advice and tested techniques. I’ve seen the change first hand from my 20 years experience as a midwife. Dads want to be there for the milestones and the daily grind, and it seems gradually, society is waking up to this fact, trying to provide more opportunities – like shared parental leave and flexible working, but while societal changes are fairly slow-paced, in the home, most families have modern expectations of fatherhood that aren’t fully supported in practical terms. Men still earn more money. Women still do more childrearing. This means today’s fathers are trying to bridge the gap between what they’re able to achieve and what they want to achieve as dads. Fundamentally, modern dads are passionate, sensitive and interested, with dads wanting to help raise well-adjusted, caring children. It’s complicated on many levels. Trying to do and say the right things and trying to be true to their own ideas of fatherhood is hard enough for a lot of men, but trying to do be a model modern dad, taking the kids to the park, taking on feeding responsibilities and everything else, while trying to provide with a full time income and be the perfect partner, can feel overwhelming. It’s almost taboo to say it because culturally speaking it feels as though men shouldn’t complain or find fatherhood challenging, when often it’s women’s lives that alter more profoundly with the arrival of a baby. Ultimately it’s not a competition and comparing isn’t a helpful approach. I find that for many men, and women, accepting the challenges of each partner’s situation is vital to moving forward as a parenting team. Doing this allows each individual to explain their situation and problem solve together. Parenthood can be strewn with intimidating situations that modern dads want to master. From knowing what to do in the labour room, to managing the early newborn days and their partner’s hormonal and emotional journey, to figuring out exactly what is expected from them once they’re at home with their new baby. Getting to a point where these situations change from being intimidating to normal is a matter of discussion, education and preparation. From books to antenatal classes with a focus on men, to forums and discussion groups for fathers, there are more and more opportunities for dads to get prepared and get well informed. Being proactive and seeking out these resources is something that modern dads will no doubt embrace, just as much as they embrace their evolving role.